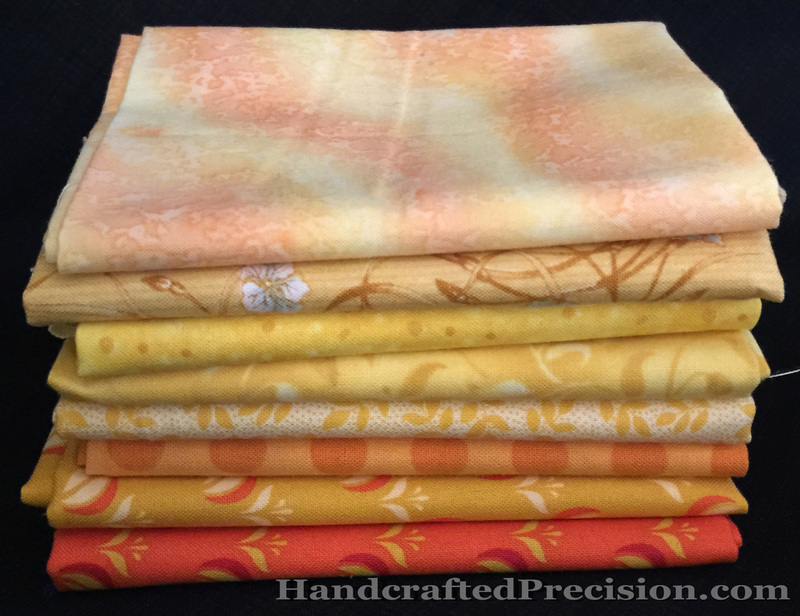 I was at the fabric store and had to add some yellow fat quarters to my stash in a bid to alleviate my yellow diamond problems. You got me. Two of those are orange, not yellow. I’m still pretty orange-obsessed. 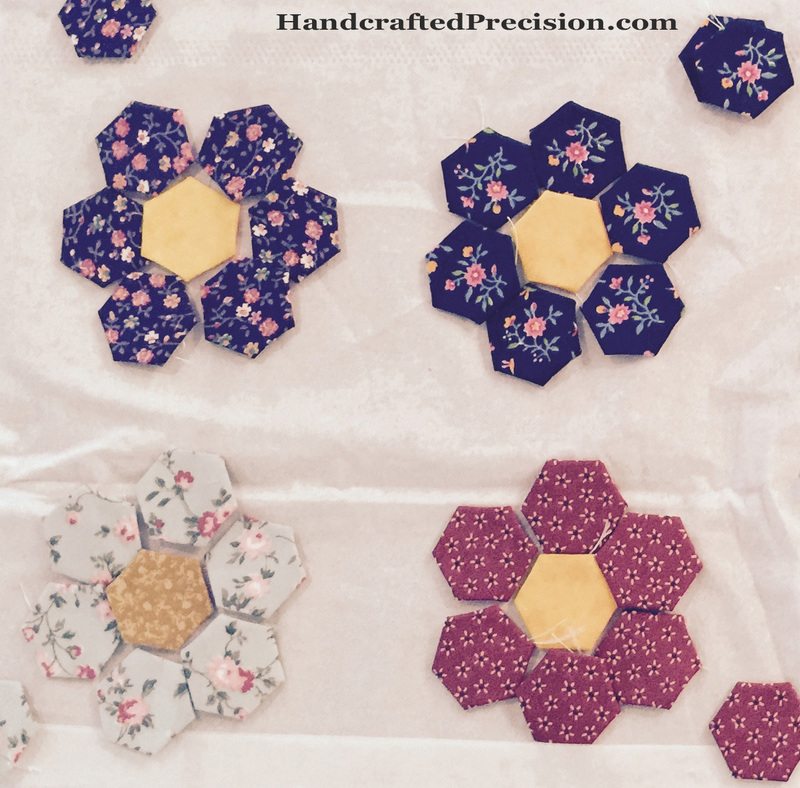 Even though I’ve changed focus to my tester flower garden project (Tiny Flower Garden), my main hexagon project (I’m Not a Machine) is never far from my mind. I hope these yellows blend with the ones I have, so I can get moving on it again as soon as Tiny Flower Garden’s done. This entry was posted in Stash, Yellow on October 28, 2014 by HP. I don’t love traditional Grandmother’s Flower Garden layouts, with large flowers and green paths, but what I especially don’t like is the very uneven edges. I don’t want to do half-flowers, either. I already have twelve flowers done and don’t want this project to become a huge deal. I also don’t like GFGs when there’s no path and just a jumble of flowers (though I see how that could be pretty–argh! No sidetracking!). Pretend that the hexes touch. The flower colors in the mockup don’t correspond to reality. I’ll applique the finished garden onto more of the same background fabric (right now, I’m planning on that being a beige crosshatch, but I’m not sure the color’s right) and then quilt (by hand? dunno) and bind the straight edges normally, probably in green. I have a green fabric in mind for the single “leaf” hexes. I need to get the leaf hexes basted, then I’ll lay it all out and snap a picture. 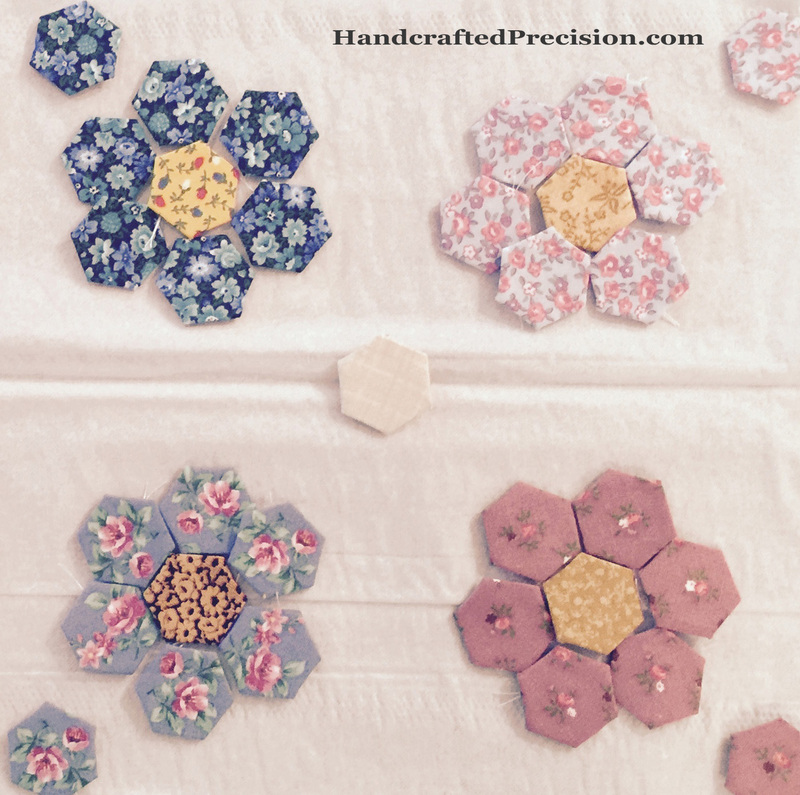 This entry was posted in English Paper Piecing, Grandmother's Flower Garden, Hand Sewing, Hexagons and tagged Tiny Flower Garden on October 26, 2014 by HP. Remember how I said I wasn’t going to make a Grandmother’s Flower Garden? But I also didn’t want to use up fabrics I like. I’m probably not going to use these flowery fabrics for anything, so they became petals. 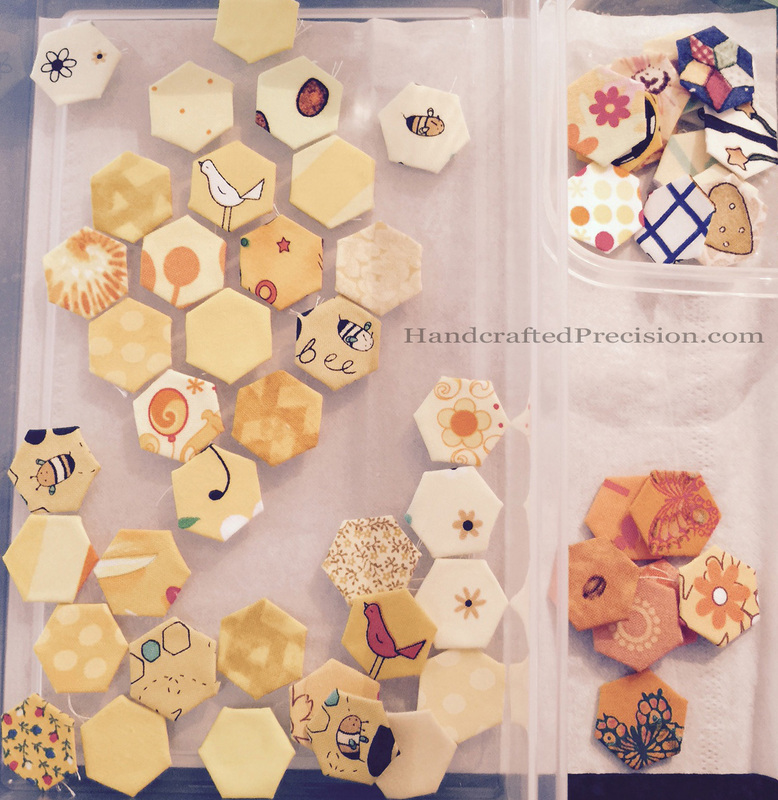 The extra petal hexagon in the photos is for my general 1/2″ hexagon pile. The ones that are predominantly one color are destined to be incorporated into diamonds. The ones that aren’t will end up in a very scrappy hexagon thing, yet to be determined. I’m auditioning centers. I bought the solid-looking yellow that you see in the first photo to make the centers, and the lady at the quilt store (a different one than the scrap class teacher, but luckily also one who’s into EPP big-time) said it was “old-timey” and appropriate, but I don’t like how it looks. I think it’s too bright. The stack of yellows and yellow-ishes on the right are all options for centers. I don’t mind repeating fabrics, so I maybe need to decide on only six or four. I dunno. I’m also not sure yet if I like the fussy-cut roses on the dark grey or the tiny buds from the same fabric or a mixture of the two. I have a lot of thinking (and sewing!) to do. 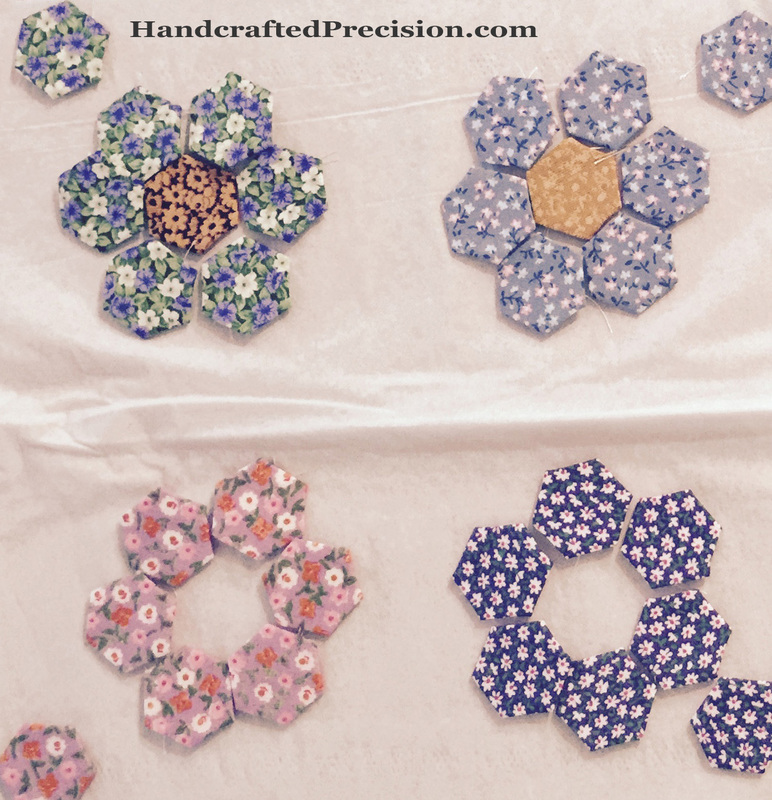 This entry was posted in English Paper Piecing, Grandmother's Flower Garden, Hand Sewing, Hexagons and tagged Tiny Flower Garden on October 19, 2014 by HP. Finally! 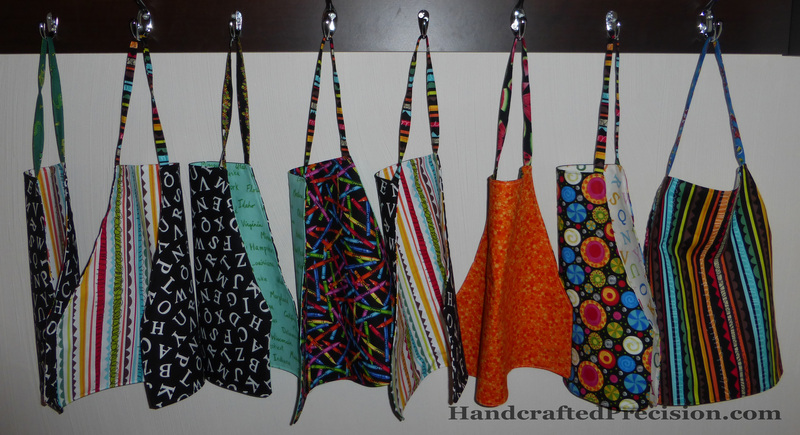 I got the other eight aprons for the school(s) done. Four will go to Sec’s teacher to join the one I already made. The other four will go to the kids’ old school. I still have two more cut out and with the lightweight stabilizer fused, but not yet assembled. Those are for home use, and I’m trying to decide if I want to add a little velcro to the neck strap or not. It would be safer, but it would get grungy fast, and might even stop working, since the strap is so narrow. Decisions! The more I look at the colorful stripe fabric on black, the more I like it. Maybe it needs to be a toddler-bed quilt backing for Ter, even though he won’t move out of the crib for months yet. Ooh! Maybe a whole-cloth quilt so I can practice quilting? With the white of the same print on the back? More decisions! I don’t love that green fabric with the state names on it. I got it because I thought it was educational, but it’s pretty ugly. AND, to add insult to injury, since it’s directional, I cut out two pieces upside down, since I didn’t even think about that when I was cutting, so you’ll see it again in whatever green or multicolored scrap quilts or projects I make in the future. But look at all of the other lovely fabrics I got scraps of. Also, see the neck straps that aren’t the multi stripe on black print? Those are all from my eBay scrap purchase. A couple of them were already ironed in half, like binding. I thought they added a little more interest. I’m so glad that these are done. I’m putting the other two away for a while until I make a decision about the neck straps. Of course, by then, Prim will need a longer apron. Another problem for future me! This entry was posted in Machine Sewing and tagged Apron on October 17, 2014 by HP. I’m still not happy with the layout for the yellow hexagon diamond. 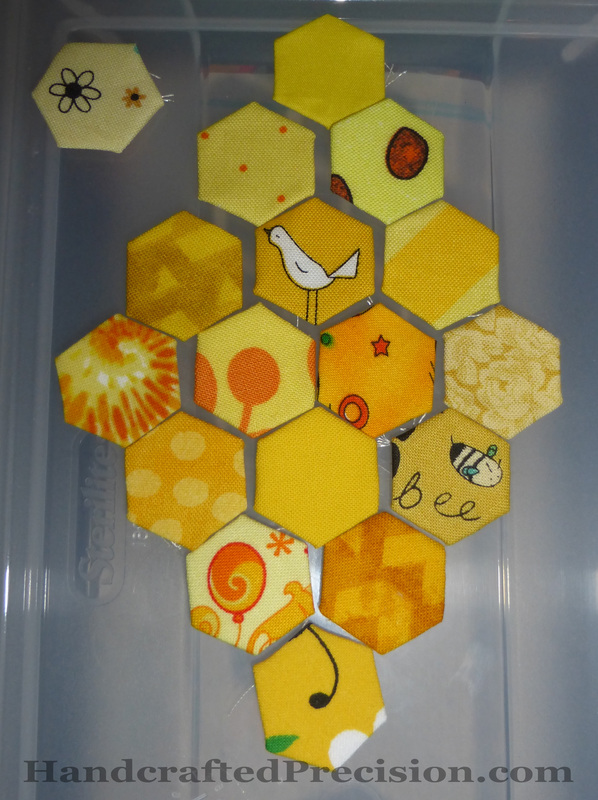 I basted a bunch more yellow hexagons, but I can’t get them to play nicely with each other. This isn’t the best picture, but you can see that I have a pretty wide variety of yellows, large differences in intensity, as well as lots of other incidental colors. I think it’s too much black and brown (and orange!) and I’m pretty sure I don’t like this layout. Here it is next to my completed orange hexagon diamond (which is upside down in the picture, but you get the idea). See how much better the orange flows? I’m at a loss for what to do next. Either I need more yellows, or I need to get used to the idea of more variety in the diamond (which might be a good thing, since it’s hard to find yellow prints with just shades of yellow). I guess I just have to let it sit a while. I have plenty of other project to work on, like poor Sec’s pumpkin quilt. It’s getting COLD here. This entry was posted in English Paper Piecing, Hand Sewing, Hexagon Diamonds, Hexagons, Yellow and tagged I'm Not a Machine on October 12, 2014 by HP. I just love how stacks of basted hexagons look: so much color and promise. Another mini charm pack (2 1/2″ squares) done. 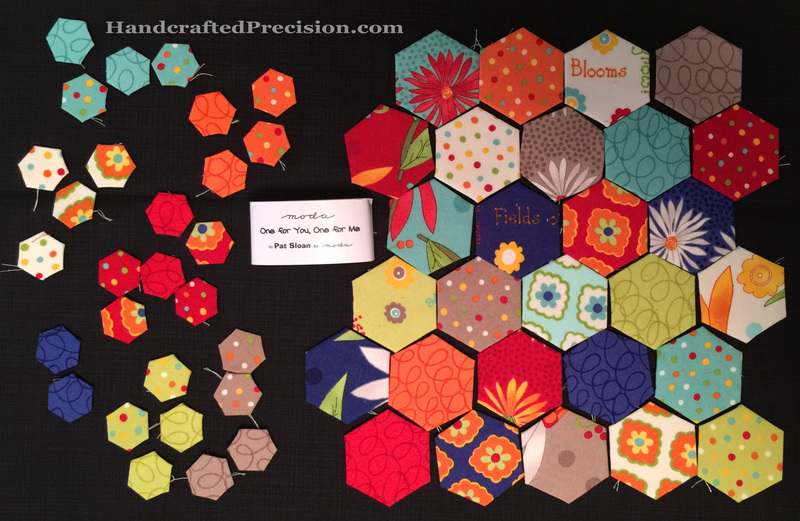 As before, I used each fabric pattern on the 1″ hexagons and used all of the repeat fabrics to make two 1/2″ hexagons. 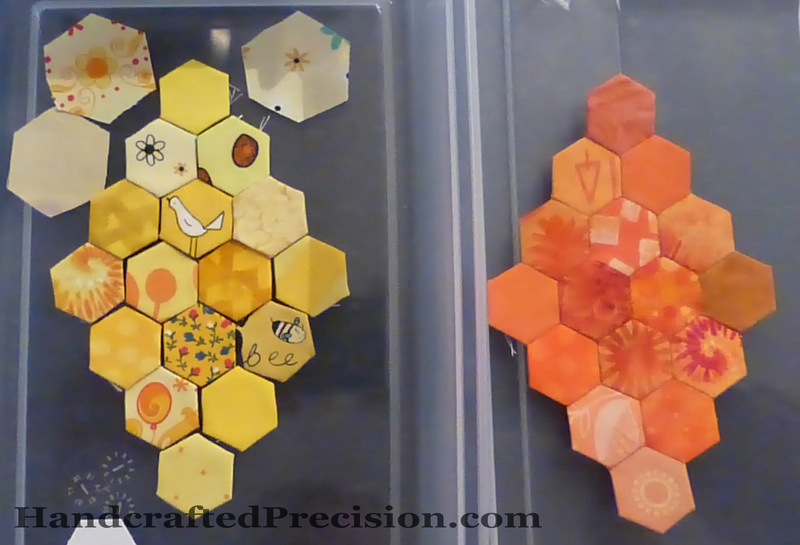 If the colors work out, one each of the 1/2″ hexagons will get added to my hexagon diamonds project, “I’m Not a Machine”, and the other will get added to the as-yet-unnamed scrappy small hexes project. The 1″ hexagons will become…something. Dunno yet. Here they are, all spread out. This pack, “One for You, One for Me” had 28 patterns, with 14 repeated. Honestly, I’m glad to see all of the repeats. The tone-on-tone swirls will be perfect for “I’m Not a Machine”. The dots might, too. I’m a little disappointed at how the large-scale patterns get lost on the 1″ hexagons. I mean, I expected that, but there’s something messy-looking about them. I’m still going to use them, but maybe I need to look for mini charm packs with more repeats and/or more basic patterns? I don’t even know how to do that, since the previews in the online stores just show the unique patterns and–duh, I just figured it out. Count the patterns shown and subtract from 42, which seems to be the standard number of pieces in Moda charm packs. 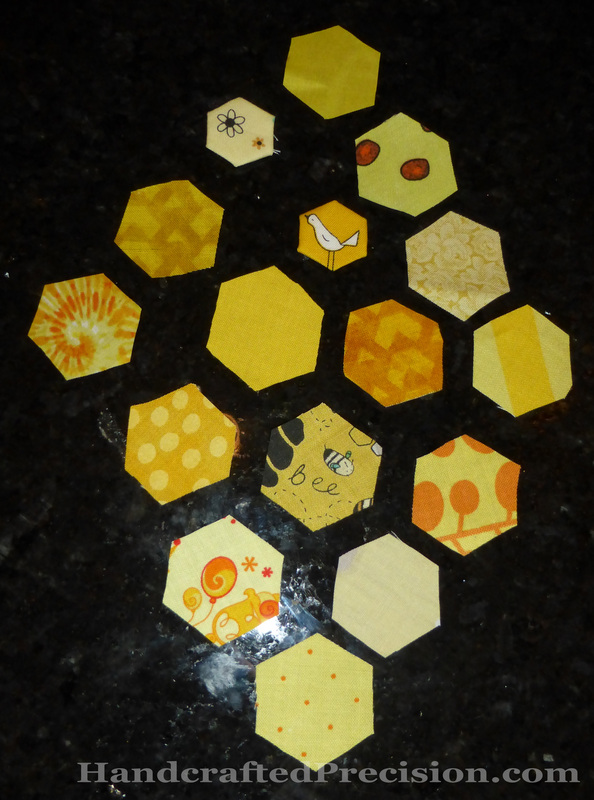 Maybe the little bits of the bigger patterns will be charming in whatever I make the 1″ hexagons into? I’ll just keep basting and see what I have and how they mix together when I have more. 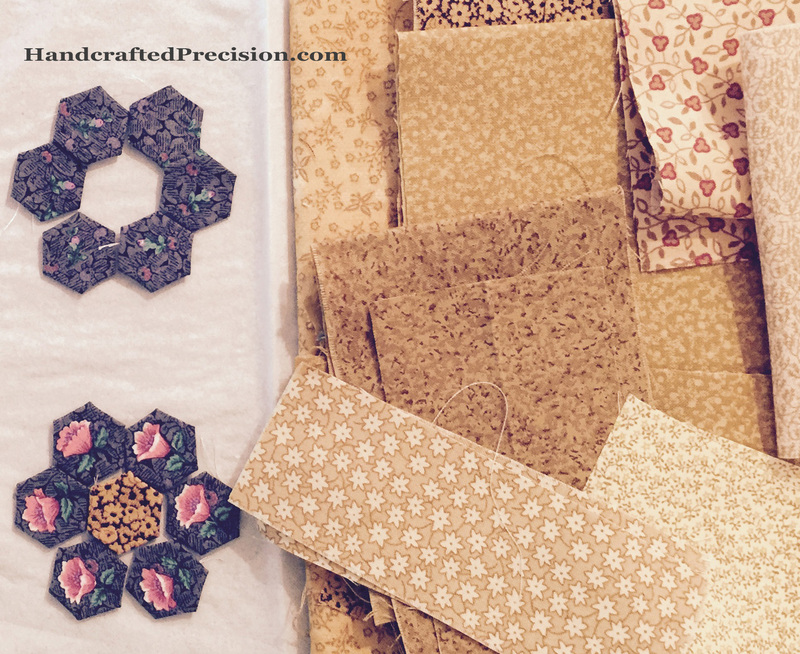 This entry was posted in English Paper Piecing, Hand Sewing, Hexagons, Precuts on October 12, 2014 by HP. I’m pretty proud of how my first hexagon diamond turned out, and I wanted to see how it would look in a different color, so I got all excited and started cutting little squares from all of my yellow scraps (and yardage). I got a bunch basted, but I’m not too happy with the layouts I’ve tried. I’m beginning to think that I just don’t have a wide enough variety of yellow fabrics. I’m trying not to repeat any fabrics in each diamond. I’ve done a bunch more fussy-cutting, since it was so popular with Prim, but bees seem to be over-represented. The scrappy oranges seemed to all meld into one another, which I liked. When I looked back I saw it was because the fabrics had mostly just shades of orange and white, with a little yellow thrown in. These yellow hexes have all sorts of colors, including strong ones like brown and black. I have to decide if I just need to beg and buy more yellow scraps/fabric or if I can be content with a diamond with more variety. I know this diamond project is going to take years and in the grand scheme of things, a few diamonds that I end up using for things other than the final project (whatever it ends up being) is no big deal. But this is my first EPP project and each diamond takes SO LONG. I know they’ll go faster as I get more comfortable hand-sewing, but I might not sew another for a little while. Basting is nice and safe. 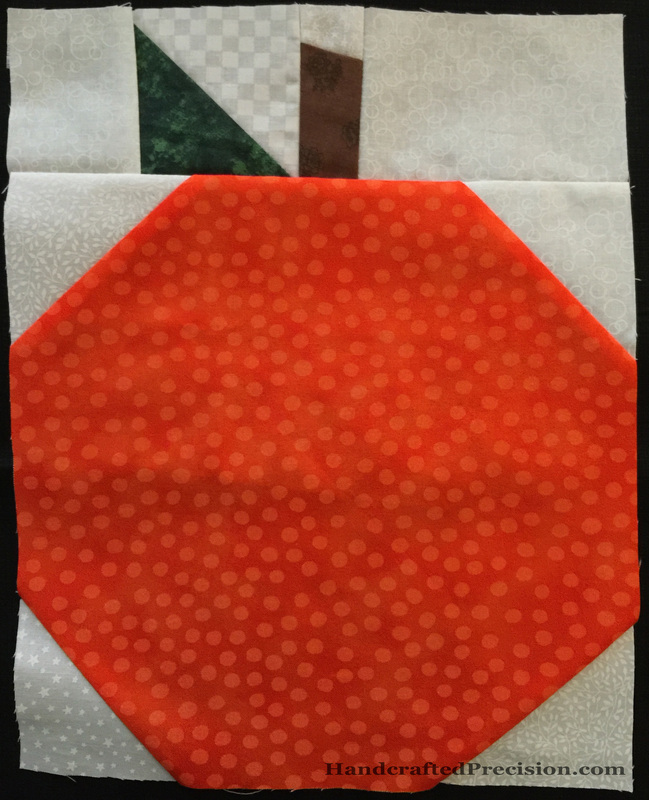 I basted some extra oranges and had some fun fussy-cutting other fabrics. 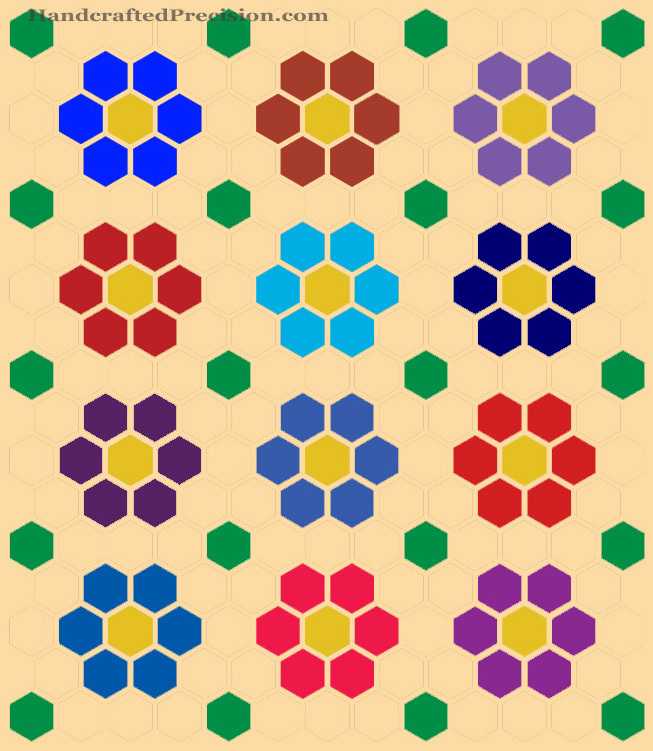 I now have a nice little pile of multicolored hexes that aren’t going to fit nicely into any color scheme save “totally random”, which is kind of cool. This entry was posted in English Paper Piecing, Hand Sewing, Hexagon Diamonds, Hexagons, Yellow and tagged I'm Not a Machine on October 5, 2014 by HP.